There may be cases where we may want to connect our USB flash / pen drive to computers only for reading the data from it. If the host computer in which you plug your USB drive may be infected and may infect your USB flash drive. If the USB drive is only being connected for data reading purposes then it makes sense to make them write protected (read only) so that the Viruses won’t be able to infect the drive. Certain USB flash / pen drives come with write protector switch in them, using which you can write protect the USB flash / pen drive or make them read only drives. 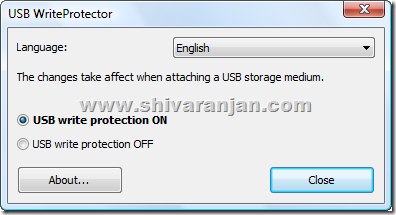 If the write protect feature is missing in the USB flash / pen drive then you can use USB Write Protector utility. USB Write Protector is a free utility that allows you make write protect your USB flash / pen drives. This is a very small utility that you can always carry with you in your portable drive. Note: This utility does not make your USB drive write protected rather it makes the host computer on which this utility is run unable to write to removable storage media like USB flash drives. If you are looking for a corporate gift idea to customize, look online. lot more, Please doo keep upp the fantastiic work.